Cheat sheets for Aira gear, detailing available functions. These are pdf files, which can be downloaded. 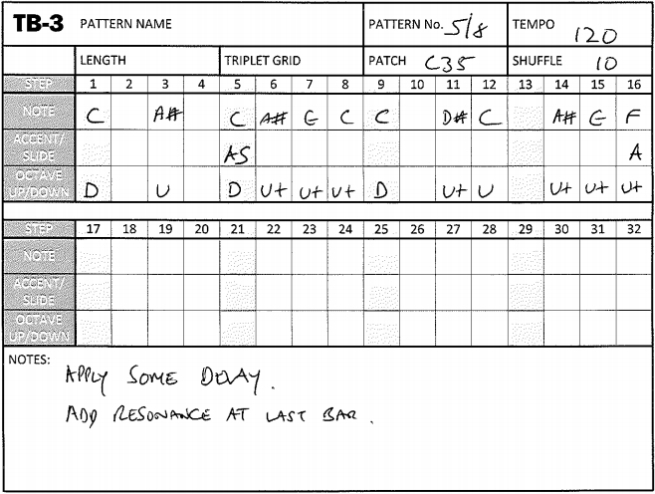 Blanks for recording TB-3 patterns. In this example, I’ve used ‘D’ to indicate a single press of the left Octave PAD and ‘U+’ to indicate two presses of the right hand octave pad, thus raising the pitch two octaves. Details all the effects settings available on the TB-3. These can only be accessed using sysex so I have included the memory addresses and available values for each of the parameters. The sysex string should be of the format F0 41 10 00 00 7B 12 ( four address locations ) ( val ) ( chksum ) F7. See the Sysex page for more details. This is a cleaned up version of the file TR-8_EfxParameter.pdf located on Roland Japan’s website and includes the TR-8 Sidechain types available for the External input. Tried to bring together all the manual references for various functions in this, especially where the SHIFT button is used. Bound to have missed something tho’ but still useful, I hope. I was getting confused which pattern I had with which kit, so I created a sheet to record them. This is on Google Drive so you can download or copy it to keep your own record, if you so wish. The blank version matches pattern 1 with kit 1, pattern 2 with kit2 and so on, but in reality they can be all over the place, so just edit as required. This now includes a separate sheet detailing the default patterns and kits. There’s not actually many ‘cheats’ I’ve found for the System-8 yet, so this is just a list of the MIDI CCs. There were actually a few missing from Roland’s official document so I’ve added them in. I’ve also added the Jupiter-8 equivalents. One big omission from this is the details of the Mastering options as it’s difficult to work out what they actually are (there’s actually 65 of them!) and I’ve been unable to find any info on any of Roland’s sites for these. The fact that they exist is not actually documented in the manual either. I’ve included the CC controls available in the mixer modes but not the Surface Controller mode and will probably do this as a separate document in the not too distant future. Thanx, I’ve got some other updates to do so will add this in. hello! first of all: thank you very much! all of you! i am new to this and i needed this cheat sheet and was searching for it. i watched a video on youtube where a guy showed how to calibrate the touchpad. he called it secret mode but i think the right name is maintenance menu or something like that because it shows a big M.
all credits for the knowledge of this goes to the guy on youtube. ive mailed the roland service team and asked for a pdf but its weekend and to be honest: i dont think that im the first one requesting a real manual for this great peace of hardware. thanks again for all your hard work. hopefully i gave some info that helps. Thanx Nico, some good info there:-) Not sure you will get much else from Roland, unfortunately but good luck. Why no VT-3 “Cheat Sheet”? It has 6 save slots now, and other additional features that I forgot per sound option. I couldn’t find a TR-8S pattern/kit list on Roland’s site so ended up making my own. Naturally, 2 days later, I found yours which is much better.